Perhaps the most blatant marketing move ever made by a video game company, Yu-Gi-Oh! does have its entertaining moments. Too bad it's in English and Spanish only. Wow. I gave this series a low score. I suppose part of it has to do with the fact that Yu-Gi-Oh! appears to be nothing more than a way to grab money from kids and collectors, but other shows are undeniably guilty of that crime. But there are a lot of negative factors leading up to this low score (low for me, at least - I like everything). But first, some background information is called for. With only one foot in the realm of Yu-Gi-Oh!, the audience is instantly introduced to the collectable trading card game, "Duel Monsters." 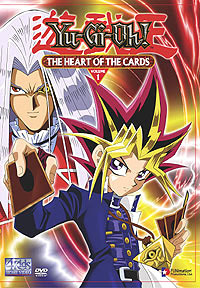 You can almost see the little dollar signs appear when Yugi helps his friend Joey learn how to play the game. Because the episodes are so short, I couldn't help but add some content to the opening scenes of the first show in my mind. "Gee," Joey asks, "where can I find these cards so that I stop being an unpopular loser?" Yugi shakes his head and says, "Sorry, Joey, I can't help you with the loser part." Joey frowns, confused, as Yugi continues, "But don't hesitate to rush out to your nearest bookstore, video game shop, or 24-hour liquor stop to find my special cards!" Yep. Those cards are special, and you know why? It's because they're really popular, and so they're hard to find. Why are they hard to find? Well, that's because they're special. Take note of the endless cycle of silliness and save yourself a load of trouble. I'm trying to not sound too jaded about the whole trading card game thing, but it's rough when you work in a place that sells them. The funny thing is, every parent that buys the cards for their kids complains about the price...to me. I just want to know how those people found out that I am the one person responsible for setting the price of everything their kids buy. I've been trying so hard to hide from them! Right. Enough ranting over things I can't change. Back to the show. The show ...isn't too bad. It can be fun to view from time to time, a sort of mind candy. Everything falls neatly into the appropriate predictable pattern for a children's' show: at least for the first few episodes. I'll let everyone know if things change as the story unfolds. This isn't by any means an ugly show. The visuals are fine, and the use of computer graphics isn't insultingly gimmicky. It doesn't raise the bar for animation, but it's no South Park, either. Aurally, however, things get worse. For some mind-boggling reason, there are two languages included on this release, and neither of them is Japanese. Throwing the original language out the cultural window, we are treated to the made-for-TV English dub and a Spanish language track. I'd be far more inclined to purchase this disc if it was uncut and in its original language. Of course, there's always the chance that it could have an excellent English language track, but I think you'd have better odds of winning the lottery twice in a row. The main characters, young kids, sound more like thirty something men. When Yugi says "open your mind" in the dramatic conclusion of the first episode, he sounds eerily like Kuato, the mutant leader of the Martian resistance in Total Recall. Every performer conveys personality, just not a personality that feels anything like the look of the character. There are some extras, though, including the even more culturally confusing "Yu-Gi-Oh! Rap." Ouch. There's also a section for monster stats included on the disc. I really don't hate this show, but I do dislike some of the marketing tactics it represents. As I said, it can be entertaining, but I feel that this release falls far short of its potential. Fans that shell out $19.99 for the title might feel the same way since you only get 60 minutes of action for the price. I suppose, however, younger fans will get more out of the disc since they'll just play the "Yu-Gi-Oh! Rap" repeatedly. Yeah, and parents will probably blame me for that, too.